We are pleased to announce our newest AAH Light partner – the Diamond Six Ranch! 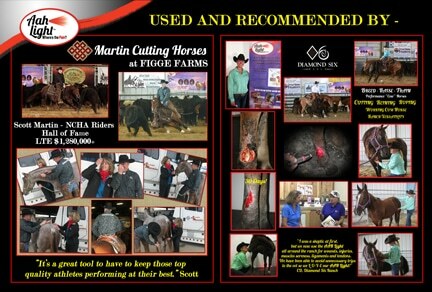 This is a working ranch that breeds, raises and trains performance “cow” horses for all disciplines. Charley DeBenedetti has found many uses for the AAH Light and has been able to reduce some of their vets bills. The AAH Light has become a part of their training and maintenance program for their performance horses as well as part of the medicine cabinet for the wounds and injuries they deal with on an on-going basis. We have the best sponsors and partners! « Lots of new Photos and Videos!